A call and challenge for every Christian is to share the good news of Jesus and make disciples. As disciples of Jesus Christ, we deeply appreciate the riches of God’s grace. We have received his love, and that love motivates us to share the gospel with others. We want others to enjoy the same relationship that we enjoy with Jesus Christ. We cannot keep this precious understanding a secret. Jesus invites us all to come to him: “Come to me, all you who are weary and burdened, and I will give you rest. Take my yoke upon you and learn from me, for I am gentle and humble in heart, and you will find rest for your souls. For my yoke is easy and my burden is light” (Matthew 11:28-30). As those who have accepted Jesus’ call, believing in him and committing our lives to him, we have already responded to the invitation to God’s kingdom. Christ now charges us with extending this same invitation to others. As Christians, we go into the world with the good news of the gospel of Jesus Christ. We share with others the good news of salvation, of reconciliation and of forgiveness. We proclaim the riches of God’s grace to those who are without hope in a broken and sinful world. As we go, we need to keep certain priorities in mind. It is possible to be a follower of Jesus without being a disciple; to be a camp-follower without being a soldier of the king; to be a hanger-on in some great work without pulling one’s weight. Once someone was talking to a great scholar about a younger man. He said, “So and so tells me that he was one of your students.” The teacher answered devastatingly, “He may have attended my lectures, but he was not one of my students.” It is one of the supreme handicaps of the church that in it there are so many distant followers of Jesus and so few real disciples” (The Gospel of Luke, The Daily Study Bible Series, rev. ed., page 196). We must first experience the saving grace of Jesus Christ before we can share it with others. Only disciples can make disciples. A second requirement needed to make disciples is to make sure that we know, understand and believe the message. The great commission does not instruct us merely to go out and make disciples. We are called to make disciples and to teach them those things Jesus commanded and taught. The world is filled with people who make disciples of themselves and for themselves. Christians have no such commission. We make disciples of Jesus Christ. Our calling is to bring people to him. It is necessary for those who disciple to remind themselves of the need to proclaim Christ crucified. Christians are agents of salvation, deputized by Christ for the purpose of making disciples of all nations. A third priority and directive we have in proclaiming the gospel of Jesus Christ is the need to be faithful. As ambassadors for Christ, we are called to be faithful to him. Paul shares this insight: “Am I now trying to win the approval of men, or of God? Or am I trying to please men? If I were still trying to please men, I would not be a servant of Christ” (Galatians 1:10). Those who share the gospel of Jesus Christ need courage and conviction. They need a commitment to be faithful, to proclaim only the one true gospel. How can individual Christians fulfill the great commission? The first step is to understand that it is not enough to be a member of a church and expect the corporate, organized body to take complete responsibility for evangelism. 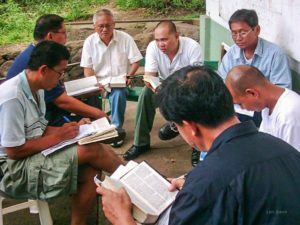 The call to evangelize puts a continual demand on the local, organized church. The church must examine itself to see how it is fulfilling the goals and objectives of the great commission. In the same way, the individual members of the Body of Christ should also examine themselves to see how they are following Jesus’ commission. Believers look outward for opportunities to evangelize. The mission fields are white with harvest, and they motivate disciples of Christ into action. Sometimes the mission field is near, sometimes in our own homes. Our families, our places of employment, our neighborhoods and our friends are fields in need of the gospel of Jesus Christ. Even a church is a place to share the gospel of Jesus Christ. Membership and attendance do not necessarily mean that the person has become a disciple of Jesus. Those who are most in need of help and ministry can be those everyone assumes have already been helped. Sometimes regular churchgoers have little understanding of the gospel, and have never made a commitment to follow Christ. We are often understandably excited about impoverished, desperate areas of the world that need the gospel of Jesus Christ. While these opportunities promise excitement and adventure, we must not ignore those who are close to us and who also need help. The contemporary Western world has become a global village. There continue to be areas of the world that are decidedly not Christian, and these areas are desperately in need of the gospel of Christ. But the world economy, the information superhighways of media and technology and massive immigration all contribute to the cultural pluralism that exists in many of our Western countries. Christians are a minority in most of the Western world. The challenge to evangelize all nations does not necessarily involve traveling to a far-off area. Opportunities to share the gospel are within reach of most of us. Making disciples is a call and challenge for every Christian, and it is as urgent and necessary today as it has ever been.